The contribution made by the numerous organisations to the well-being of the local community in Haywards Heath is highly valued. In support of such voluntary efforts the Town Council allocates a modest annual budget to award small grants to voluntary and community groups, subject to available resources. The purpose of such grants is to support voluntary and community initiatives that benefit the residents of Haywards Heath. Organisations looking to apply for a grant from the Town Council are strongly advised to read the Council's grant criteria (contained within the application pack) to ensure they are eligible to apply for a grant; it is also advisable for applicants to contact the Town Council to discuss their project prior to applying. To download an application pack, click here. For more information please contact the Town Council. 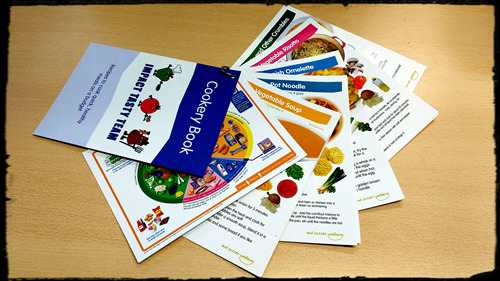 The Impact 'Tasty Team' run healthy cooking programmes targeting children and vulnerable adults. 'Tasty Sessions' are run with the aim of educating participants on trying new food and flavours with an emphasis on fresh produce that is beneficial to health. The Impact Foundation benefited from a £500 grant towards the cost of equipment and running costs. The Impact 'Tasty Team' Healthy Cookery book. The 172 Squadron, Air Training Corps serves the youth and community within the Haywards Heath/Sussex Area as part of the Royal Air Force Air Cadets. The 172 Squadron benefited from a grant of £450 towards the provision of event shelter and tents to support their community activities. This allowed them to replace their decidedly tired weather worn tents with suitable weatherproof hike tents suitable for various camping activities including the Duke of Edinburgh's Award expedititions. To see a list of awards made in the last financial year, please click here. Mid Sussex District Council (MSDC) offer Community and Economic Development Grants, Facility Grants and a Spotlight Programme. To find out more information of these funding opportunities, please click here. West Sussex Crowd is now live. Please follow click here to find out more information on funding and to upload your poject to start fundraising for your good cause. A local Sussex Grant Maker particularly interested in hearing from groups in Sussex supporting older people and/or people at risk of homelessness and groups supporting children and young people. Grants available for small charities and community groups. To find out more information about the Sussex Community Foundation, please click here. Funding is available from the Big Lottery Fund, a large proportion of which is awarded to voluntary and community sector organisations. To find out more information of the Big Lottery Fund, please click here. If your project helps to support those linked with the Armed Services, funding and grants are available from the Government. To find out more about the Government Covenant Fund, please click here. HAMSVA (Horsham and Mid Sussex Voluntary Action) offer support with setting up as a community group and for funding advice. For more information on HAMSVA and its services, please click here.